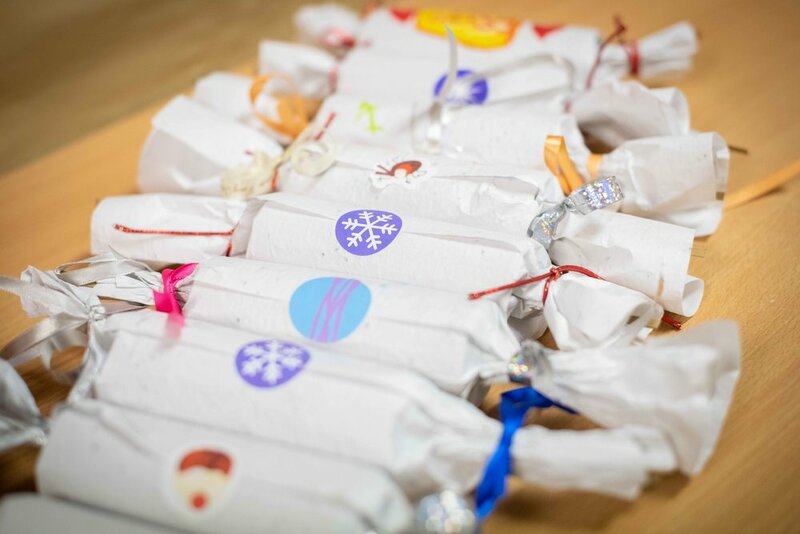 On Tuesday Class 1 and Class 2 helped make the crackers for their Christmas party, but these were no ordinary crackers - these were seed paper crackers. If you’re not familiar with the term, it’s basically a very eco-friendly cracker that uses paper impregnated with seeds that can be replanted in the Spring and left to germinate. It’s a brilliant concept that ties in perfectly with the school’s desire to improve its eco-footprint and encourage the children to become more sustainably aware. The activity began with the teachers showing the children the seed paper. It was explained to them that instead of just throwing the disused crackers away, this year, they will be replanted on the allotment. The paper is embedded with various flower seeds that are good for butterflies and bees - Chrysanthemum “Golden Ball”, White Gypsophilia “Baby’s Breath”, Snapdragon “Rainbow Mix”, Iberis Umbellata “Candytuft”, Lobularia “Snowcloth”, Ageratum “Blue Mink”, Petunia, Godetia, Azalea and Dorotheanthus. …with a little bit of jiggling everything seemed to just about fit. It was lovely to see the children try various different techniques in order to try and keep the innards inside the cracker whilst they wrapped the cardboard tube in the paper. Some methods were more successful than others but it was good to see the principle of trial and error being applied. Next, the teachers helped the younger ones to wrap the recyclable cardboard tube lengthways in the plantable paper. …and hey presto - one seed paper cracker! By the end of the session a big bundle of crackers was beginning to pile up, all looking wonderfully festive and hand made. There will be thirty seven in total all bursting with seeds, which come the Spring, the children will plant on the allotment to help attract birds, bees and other wildlife. It was a true lesson in sustainability, a wonderful hands on classroom activity, a bit of festive fun and a fantastic opportunity to engage the children in new ways of thinking about waste, the environment and their sustainable footprint. The children enjoyed the Christmas party yesterday and it was so lovely to see the seed paper crackers in action. The paper was collected up and is now being stored safely until the Spring, when the children will plant it on the allotment.